A few weeks ago a co-worker was going to throw an overly ripe banana away. Instead, I took it home and put it in my freezer. I ended up making my pistachio and date banana bread with her kind contribution. I apparently created a name for myself as a brown banana hoarder because last week she gave me two more bananas. I debated making banana muffins, but I wasn’t in a muffin mood. 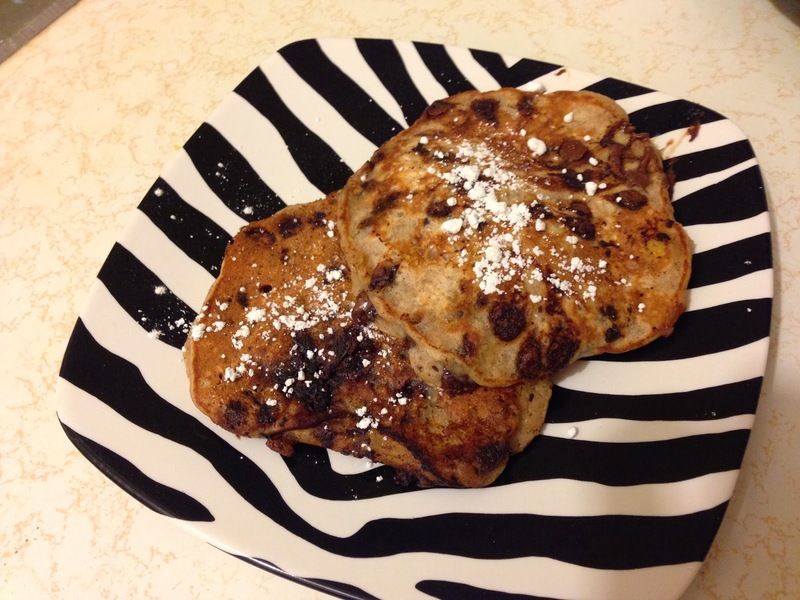 I was in the mood for pancakes, and why eat banana pancakes when you can eat banana pancakes with chocolate chips? I made some minor adjustments to a banana pancake recipe from Allrecipies, and they turned out great, if I do say so myself. I added nutmeg, cinnamon, vanilla, and chocolate chips to the original recipe. I also swapped the white sugar for brown sugar. I combined the flour, brown sugar, baking powder, salt, cinnamon and nutmeg. Before making this recipe, I had thrown out my baking powder because it had passed its expiration date. On the way home from work, I went to TWO grocery stores looking for baking powder. Neither of them had any. I deserve an award for my perseverance. Anyway, I mashed the bananas. They were pretty mushy already because they had been frozen. I added the egg, milk, oil, and vanilla to the bananas. I stirred. I poured the liquids into the dry ingredients. Before the flour streaks had disappeared, I added the chips. Sometimes I call them chips because I like pet names. I should get in the habit of calling them little morsels of chocolaty goodness. I added a sliver of butter to a hot skillet. Once it was melted, I added a little less than half a cup of the batter to the pan. The recipe only calls for a fourth of a cup, but I don’t have time for that. When the edges firm up and little air bubbles start forming near the middle of the cake, flip it. Flip it with care. I try to show love towards my food; it sustains me. I browned the other side. I don’t have any helpful advice to know when it’s done. I then proceeded to eat these gems with a light sprinkling of powdered sugar. I thought they were sweet enough without syrup, but you can always guild the lily. If you are looking for a caloric-fest, these would be fantastic with peanut butter and syrup. I would have done it myself, but alas, the idea came after the pancakes were gone. I freeze browning bananas too but I've most always used them in muffins. 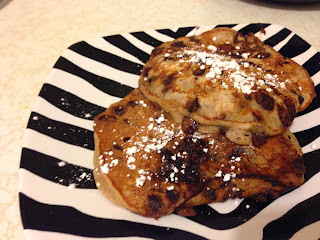 I made pancakes once but never thought to use choc chips. Argh! Next time! Banana pancakes are such a great way to start the day. 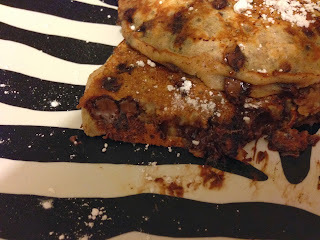 I love that you added chocolate to them! Thanks Consuelo and Colette! This is a great use of brown bananas. These look so amazing Laura! I love banana and chocolate together so I know these pancakes are going to be fantastic - yum! Banana chocolate chip pancakes?? Count me in! These look sooo good!